Who is Sunengy Pty Ltd? Sunengy is a solar power company incorporated in NSW, Australia in 2005. Its vision is to bring viable and affordable solar power to the world. Sunengy holds the patent for a unique, revolutionary, floating-on-water, Liquid Solar Array (LSA) solar technology system in Australia, Canada, Singapore, South Africa, Russia, Israel, USA, Malaysia, Japan and China. The patent is currently pending in 12 other countries. Traditional solar Concentrated Photovoltaic (CPV) technology has been around for years but it remains expensive. CPV has great potential for cost reductions in solar power as it uses much less semiconductor material than the standard flat-plate PV, but other aspects have limited its usage. Sunengy looked behind the reasons for the high cost. Traditional systems require expensive structures to withstand periodic strong winds and also require significant land acquisition. The LSA avoids these. When located on and combined with hydroelectric dams, LSA provides the breakthroughs of reduced cost and “on demand” 24/7 availability that are necessary for solar power to become more widely used. It uses traditional Concentrator Photovoltaic (CPV) technology – a lens and a small area of solar cells that tracks the sun throughout the day, like a sunflower. 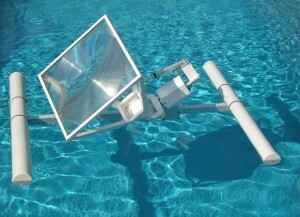 Floating the system on water reduces the need for expensive supporting structures to protect it from high winds. 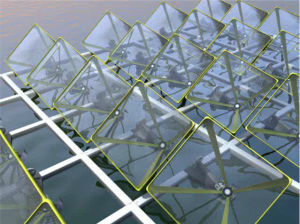 The lenses submerge in winds above 60km/hr and the water also cools the cells which increases their efficiency. 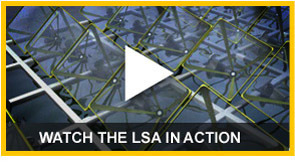 LSA can tap into the existing power grid of the dam and is effectively cyclone proof. 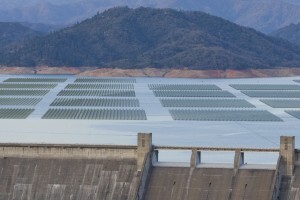 LSA turns a dam into a very large battery by supplying a significant amount of the site’s daytime power output from the solar collectors, keeping the water in reserve. Energy from direct sunlight is focused by a thin lens down to a sealed alloy well containing photovoltaic cells. Collectors rotate, tracking the sun using a light sensor and dead reckoning software. The lens is sealed and is cleaned automatically. An inverter converts LSA power from direct current (DC) to alternating current (AC), which is then connected to the power grid. Low cost – Structure and concentrator lens made from very light-weight, mass producible plastics. Reliable – Uses proven ‘off the shelf’ technologies with an achievable life span of up to 20 years. Modular – Any scale from 1kW to Giga-watts. Constant output – Near constant output all day and can leverage any improvements in PV cells. Water saving – Lessens water use for hydropower generation (a 60% reduction is possible) and reduces evaporation. Who will benefit from LSA technology? The environment – increased use of solar can help reduce reliance on fossil fuels. Users of industrial scale electricity linked to hydropower facilities, which is a large fraction of the world’s power grid. Mining sites as well as remote communities and island nations reliant on diesel generators. Villages remote from a traditional power grid. Developing nations in tropical and sub-tropical regions can industrialise and improve living standards without pollution. LSA has the potential to produce solar power at half the cost of conventional solar technology right now and achieve price parity with fossil fuels in the medium term. 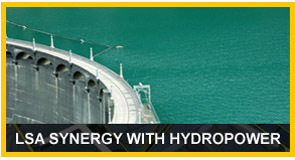 Hydropower supplies 87% of the world’s renewable energy and 16% of the world’s power but is limited by its water resource. 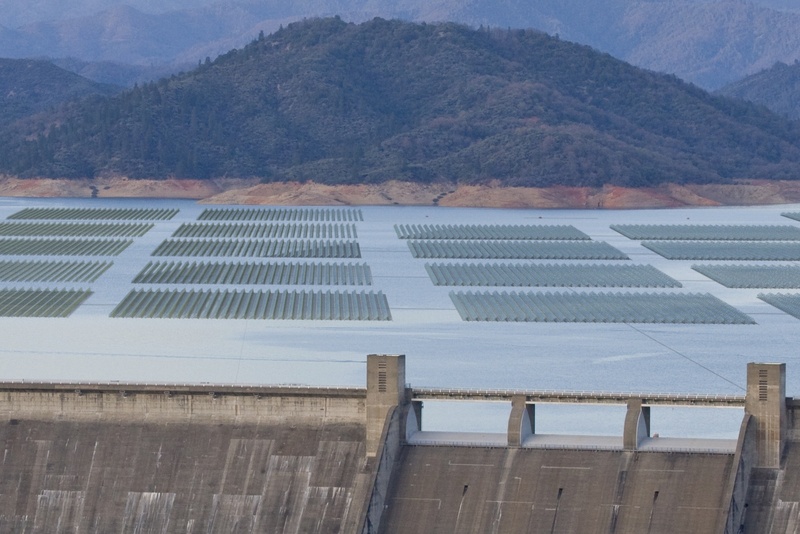 An LSA installation could match the power output of a typical hydro dam using less than 10% of its surface area and supply an additional six to eight hours of energy per day. Modelling by Sunengy shows that a 240 MW LSA system could increase annual power generation at the Portuguese hydro plant, Alqueva, by 230%. If India uses just one percent of its 30,000 square kilometres of captured water with our system, LSA could generate power equivalent to 15 large, coal fired, power stations. Sunengy has secured equity from India’s largest private power company Tata Power through Trust Energy Pte Limited of Singapore, a 100% owned and operated subsidiary of Tata Power. The joint venture will commence construction of a demonstration plant in India in August 2011. Preliminary testing of the units for India will be carried out by CSIRO Energy Centre in Newcastle, NSW. A larger LSA system is planned for the NSW Hunter Valley in mid 2012 before going into full production.